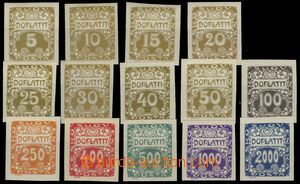 1922 Pof.DL24a, Postage Due - overprint issue Hradcany 100/80, dark violet overprint, extremely wide margins, exp. by Gilbert.., Karasek. 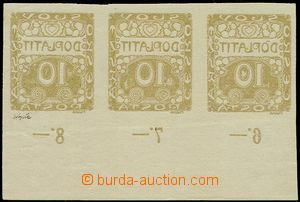 1926 Pof.DL46A ST, Postage Due - overprint issue Agriculture and Science 60/400, upper and the bottom block of four with joined types II. + I..
1919 emergency nefilatelistické(!) usage postage-due stamp. 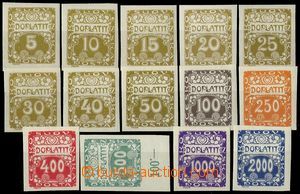 used as postage, cut from credit notes franked Postage due stamps with overprint FRANCO, Pof.DL1, DL2 2x, nationalized CDS LETOVICE/ 11.III.19, on reverse arrival postmark BRNO 1/ 11.III.19; incomplete but readable print posting CDS, rare! 1927 comp. 2 pcs of letters, official PC zasílaná in the place, porto 50h postpaid with stmp Pof.DL32,33, good condition; letter with Pof.207, CDS JIHLAVA/ 11.7.27, to Helenína (today part Jihlava), disallowed franking after/behind letter in the place, burdened with postage-due paid stamp. Pof.DL33 and DL45, interesting, decorative!